This almond scented cake boasts a tender crumb and is the perfect base for virtually any frozen fruit. Greek yogurt keep the cake moist and rich while lemon zest and blueberries add a subtle tang. Melt the butter. Brush a tall-sided 8" cake pan with about 1 tablespoon of the melted butter and line the pan with a round of parchment. Brush with parchment with more butter. 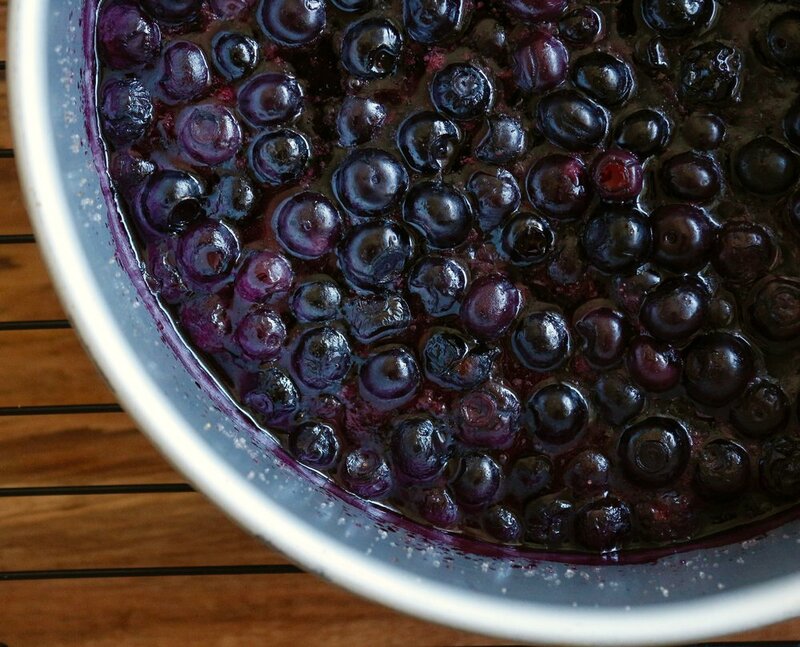 Toss the frozen blueberries with 35g sugar, 28g of the melted butter, and the lemon juice in the cake pan. The butter will solidify on contact with the frozen blueberries, but combine as much as possible. 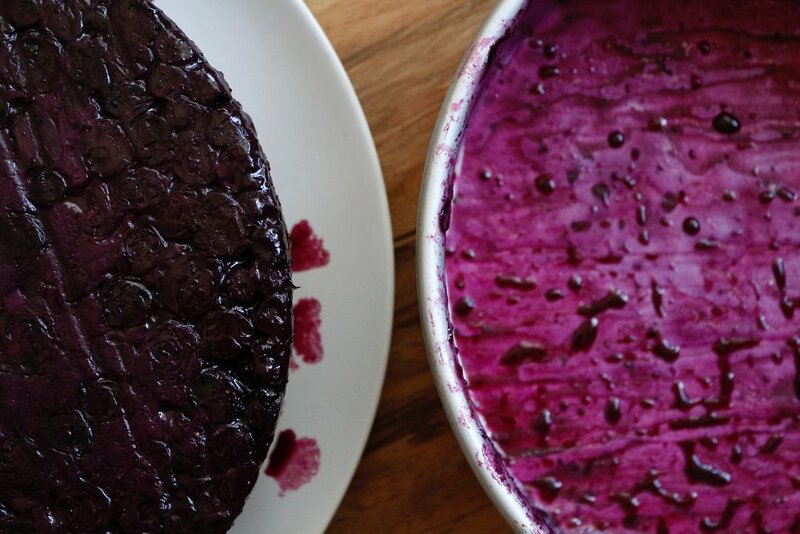 Bake the blueberry mixture for about 35-40 minutes until the fruit has mostly burst and the liquid is syrupy. Remove from the oven and let cool slightly. In a medium bowl add the flour, salt, baking soda, baking powder, and remaining 215g sugar and whisk to combine. Make a well in the center of the dry ingredients and add the eggs, Greek yogurt, lemon zest, vanilla and almond extracts, and remaining melted butter. Whisk until the batter is smooth with minimal lumps. Spoon the cake batter over the blueberry mixture and spread to cover as much as possible. Bake for about 45-55 minutes until a cake tester inserted into the center comes out clean. 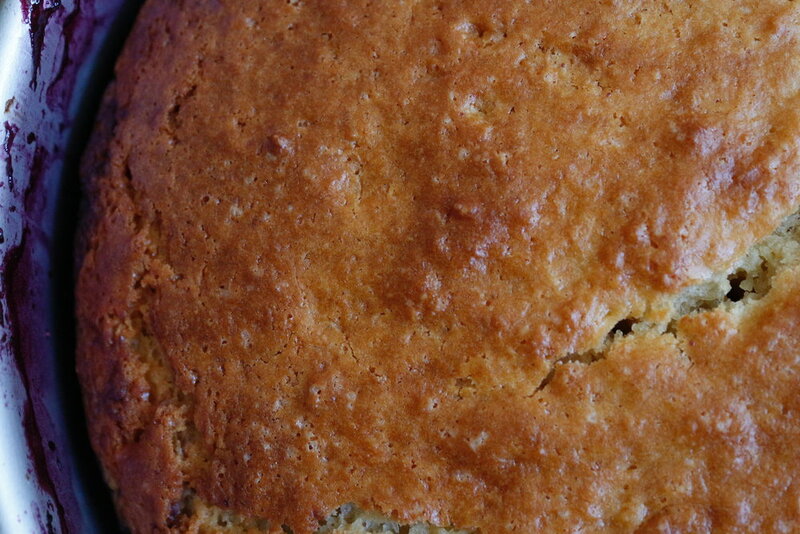 Let the cake cool for about 30 minutes, then run a sharp knife around the edges of the pan to help it release. Invert the cake onto a plate and allow it to cool completely before serving.